The Emerald Cross Diamond Pendant in 10K White Gold hangs gently from a white gold necklace as a wonderful reminder of faith and devotion. 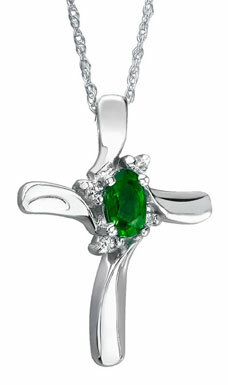 The immediately recognizable image of a cross is adorned with an emerald and diamonds that breathe life into the piece. The crown jewel of this 10K white-gold pendant is the impressive oval-cut emerald (5 x 3 mm, 0.35 ct.) set into the point in the cross where the two gold arms meet. Surrounding the green gemstone are four accent diamonds with a 0.05 total carat weight. A hidden hole at the top of the cross allows for a chain to slide through. In this piece, the white gold and diamonds are like a match made in heaven, and made even more spectacular by the stunning green emerald situated at the center of the piece. This lovely symbol of the cross is sure to bring out the best in the one who wears it. We guarantee our Emerald Cross Diamond Pendant in 10K White Gold to be high quality, authentic jewelry, as described above.